Today’s increasingly competitive marketplace requires that companies make targeted, data driven business decisions to secure their standing in the industry. One of the most viable methods for an organization to remain a top contender is by leveraging company data to provide greater oversight and offer analytics-based business actions. Business intelligence software enables companies to efficiently detect and evaluate structural patterns, anticipate industry trends and offer greater operational visibility. The key is to transform this intelligence into actions that has an impact on revenues or trigger a factor (reputation, brand awareness, PR etc) the company is focusing on. In simple words, data inspires creativity and pin points engagement. Generating data is fine, but interpreting it and driving it into action points and then monitoring results, fine-tuning the offer, till optimization is reached is what we believe in. Data gives client the intelligence required – we provide the optimal interpretation necessary. 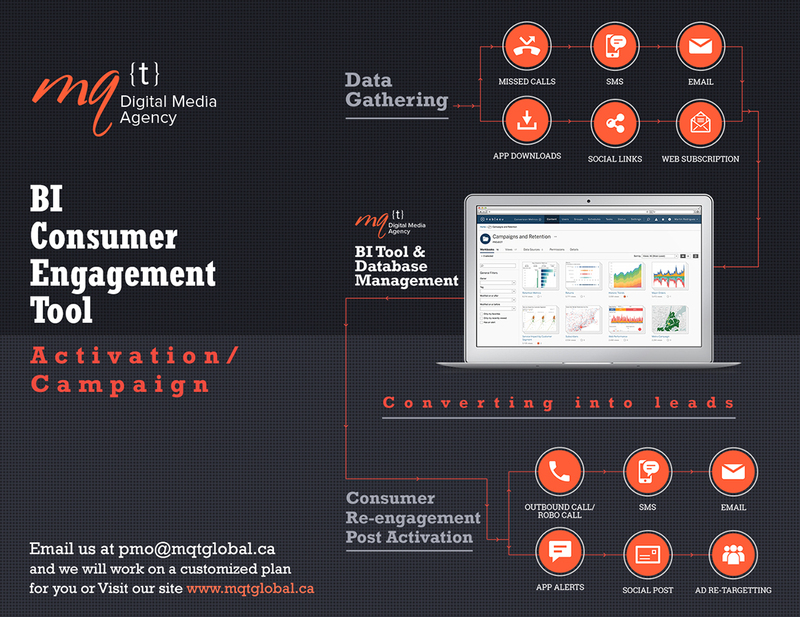 Enabled B2B and B2C digital engagement for one of the largest Communication companies in Mississauga & Brampton. We sat down with the team and clearly understood their quarterly, bi-annual and annual objectives. Based on core objectives, we built two separate strategies for each segment (Business and Consumer). Consumer strategy consisted of an integrated digital strategy to generate consumer engagement, generate queries via emails, call-ins and build their foot traffic. We manage all components of this strategy including creative’s, social, website, PPC, content & BI. B2B strategy included email marketing, new partner registrations, after sales service, bulk discounts etc. Work: Strategy, Search, Social Management, Web Management, Email Marketing, BI & Creative’s. One of the iconic auction company based out of Vancouver. Major transformation from traditional advertising to digital media, rope in new younger clients and establish ‘Digital’ credibility amongst geographically diverse markets. Our challenge was to show our presence on various digital forums, get customer reviews and experience and share it with new customers. Based on the auction schedule we pick the campaign, it can be geo-location based (auctions in Calgary, Vancouver, Mississauga) or Ethnic based (Mainstream, Chinese, Persian, Sub-continent). Embracing a digital strategy helped them to be more focused and increase ROI multi-fold. We developed a complete integrated strategy based on auction schedules, core target segments, message required to get across, auction invites & auction sales. Six months into digital activation, Federal Auction is ranked number 1 in Canada for auctions, web traffic up 4 time over past three months with no online advertising. No, a new younger breed of customer registrations. Auction is back in Fashion! Work: Strategy, Search, Social Management, BI & Creatives. One of the premier Volkswagen Dealership in Brampton. Key goal was to create awareness around new premises, good customer experiences and build digital PR around the iconic VW brand. We built an integrated strategy, focusing on location, ‘family of customers and make sure that they site is ranked as No. 1 when customers are searching for new or pre-owned VW vehicles. Customer testimonies, Bramgate Family, Employee of the month and other such initiatives exhibited a very family friendly atmosphere of this dealership and attracted referrals from existing customers too. A very innovative initiative by creative Canadian minds to generate electricity from heat and marketing this invention to non for profit agencies around the world was the objective. There are more than 1.2Billion people without access to electricity and Ospreywoodlabs’ invention can impact millions of lives. We build their identity, website, content, and managed their social touchpoints. This was our small contribution towards changing livings of millions. Building backend insurance softwares involves core insurance functional knowledge backed up by core processing tools and web interface. These are complex softwares equipping Insurance companies to take advantage of quick quotations for their clients and business partners. MQT helps develop software that enables insurance business to leverage digital age.